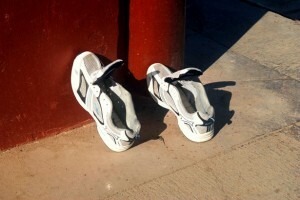 When I practiced in California from 2003 to 2007, customized orthotics were all the rage. Patients with foot problems wanted $250.00 insoles to cure them of chronic foot pain. Simple. Easy. Let’s go! So there they were, expectantly standing on a foam board, letting their body weight sink them into the foam and leaving a perfectly customized foot print. I would then send them off to the manufacturer and 2 weeks later, the patient received an insole orthotic support perfectly customized to their feet. Pop! They’d slip these insoles into their shoes and whammo, let the healing begin. The question is, did they work? Actually, for some patients, yes they did. The best results were for patients suffering from plantar fasciitis. Arch supports raise the middle (i.e. : transverse and longitudinal) arches and put some slack on the plantar fascia. Helping to release the pressure on this ligament. Other patients who had hard to solve foot pain also often benefitted from customized orthotic insoles. I estimate that roughly 75% of patients who received orthotics were satisfied. Obviously, when you drop a couple hundred dollars on medical equipment, you want the results to be drastic or else buyer’s remorse sets in. My main problem with orthotics is the price-per-pain-relief ratio. Your corner pharmacy will carry generic insoles for about $20.00. In my experience, if a patient will benefit from orthotics, they will get about 60% of the same effect from the cheap, generic insoles. For many, the extra $230.00 for an extra 40% pain relief is worth the price tag. And I don’t blame them. Customized orthotics do provide the most protection for sore feet. Your amount of pain will determine your motivation for paying the high price tag. Orthotics usually last 3 or more years – depending on use – so they can potentially save you money in reduced treatment fees. Foot care is a game of keeping the foot arches happy. As you can see below, the bones in your feet are arched upward. When you stand, your body weight would collapse these bones if it wasn’t for the ligaments and tendons that hold them up. Although some schools of thought say nature dictates “barefoot is best,” we were never meant to walk on cement and marble. So unless you are living in a forest or jungle, your feet will need help absorbing the force of your daily activities. 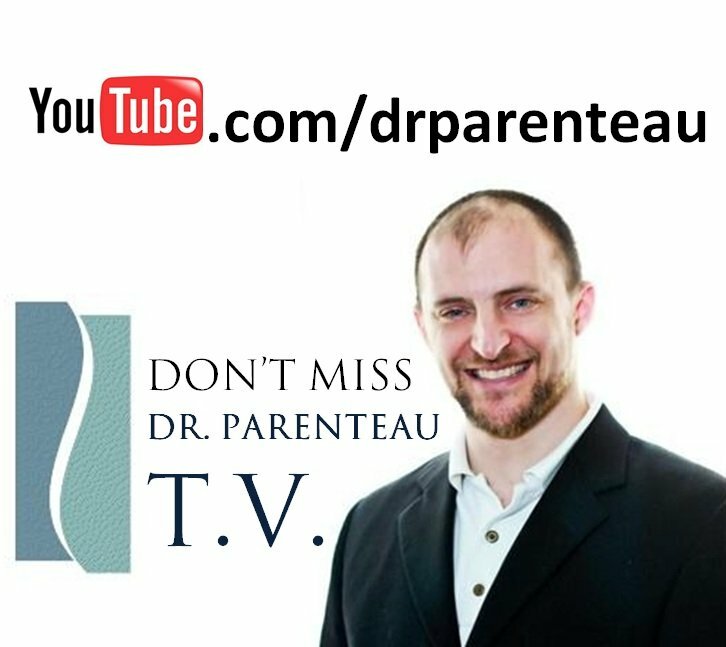 If you have been diagnosed with plantar fasciitis, watch the following video and follow the home care instructions. If these fail to heal you, come in for treatment. 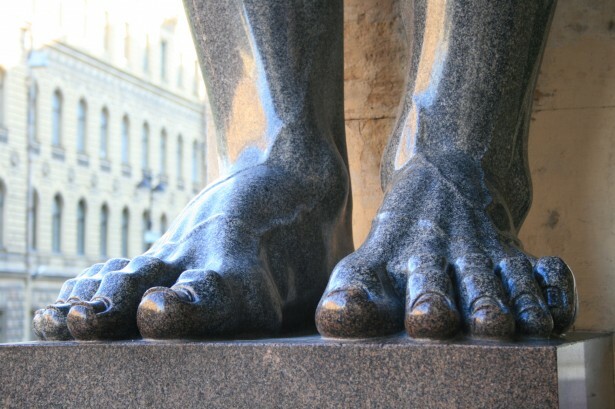 Human feet are a marvel of engineering. The amount of stress that goes through the average person’s foot in a lifetime would break stainless steel mechanical feet a dozen times over. Yet the flesh and bone miracle dangling at the end of our legs is capable of handling the load. Now, if you run as part of your fitness lifestyle, you are putting your feet through 2 to 3 times more force than a non-runner. So you’ll most likely end up with some form of foot injury at one point or another. Runners should be able to tell the difference between soft tissue pain and a stress fracture that is affecting the bones. This article focuses on injuries caused by over-use, not due to a fall or other trauma. Runners are notorious for training too often or too long and consequently suffering some form of over training tissue damage. If you hurt yourself suddenly by rolling the ankle, twisting the foot in a painful way or falling, you will need to be assessed by the emergency room to rule out a traumatic fracture. So How Do I Know If I Have a Soft Tissue Injury? 1. 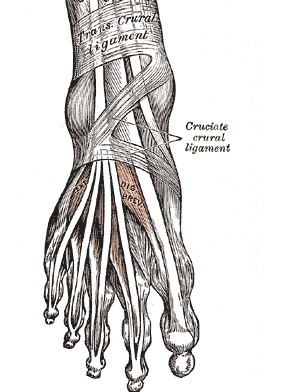 Behind the inside bone of the ankle: this is where 3 major tendons (the posterior tibialis, flexor digitorum longus and the flexor hallucis longus) pass and connect to various bones of the foot. Overuse of these, especially in runners will manifest as pain, especially the morning after a run when you first get out of bed to start your day. 2. 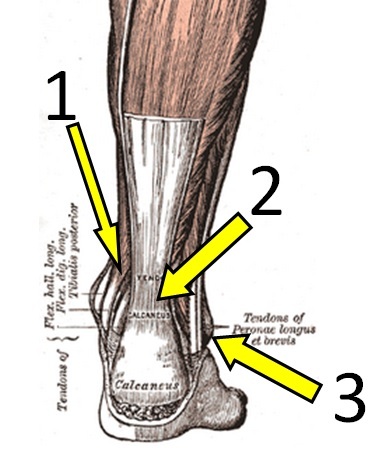 The achilles tendon: this is a very common problem for runners, especially way down on the heel bone itself. Although pain can occur higher up as well. 3. 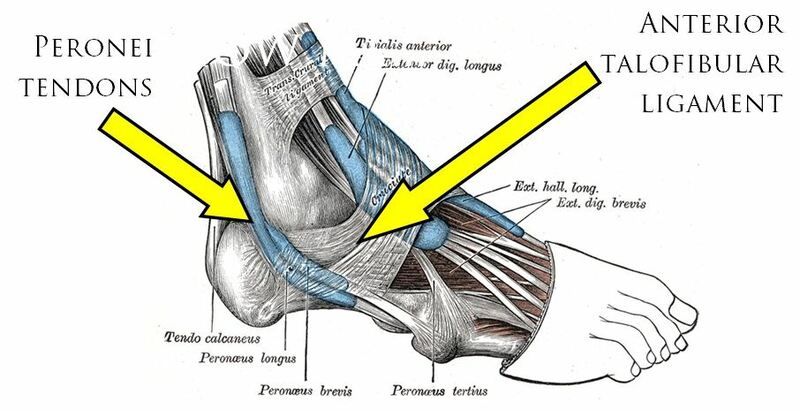 Behind the outside bone of the ankle: the peroneus brevis and longus come through this area and when inflammed by overuse, will cause pain once you’ve cooled down from a work (or sometimes during a workout). The top of the foot has a complex network of tendons, ligaments and muscles that are susceptible to repetitive strain such as running. 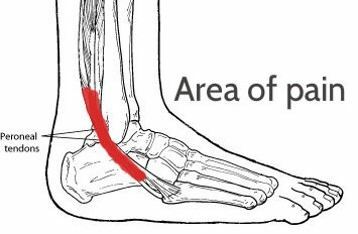 This area can be painful but is most likely a soft tissue problem. 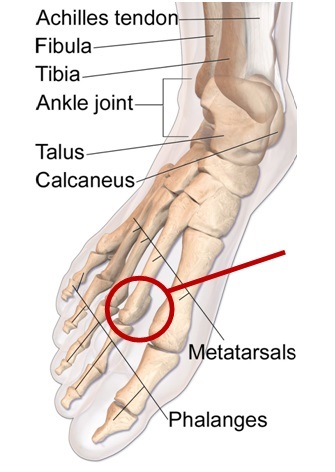 The most typical site of pain for stress fractures is the bottom of the 2nd metatarsal head. If you look down at your second toe (the one next to your big toe) and put your finger underneath it, then travel down until you are just passed the ball of the foot, this is the hot spot for stress fracture pain in the feet. A stress fracture occurs when too much physical stress is placed on the foot over an extended period of time. When we work out and put strain on our skeleton, the bones break down. With adequate rest the bones build back up. If you train too much however, you cannot keep up with the breaking down of your bones and you slowly develop a fracture. The classic symptoms of a stress fracture is constant pain, even when laying down. However, the pain goes up considerably when you stand up and becomes intolerable when you try and walk or run. If you have this type of pain, especially if it is under the head of the 2nd metatarsal, you will need an x-ray to determine the condition of your bones. 3. the amount of running you do. **please see this site for more details of the nutritional elements that assist recovery from stress fractures.